The latest figures from Spain’s National Statistics Institute (INE) show that tourist spending rocketed towards the end of last year. Average daily expenditure in November 2018 was 12.4% higher than for the same month in 2017, standing at €155. The Post Office Holiday Barometer reports that £83.58 is enough to cover a two-course lunch, three-course dinner with wine and assorted essentials (drinks, sun cream, insect repellent) in Spain’s Costa Blanca region, so a daily spend of €155 is more than enough to enjoy the area thoroughly. Average temperatures in the Costa Blanca at that time of year stand at around 16°C; even in January the average is 11°C, with a high of 16°C. Add to that the plentiful availability of quick, cheap flights, a range of superb golf courses and one of the world’s healthiest and tastiest cuisines, and the lure of Spain to British holidaymakers in the winter months is not difficult to understand. 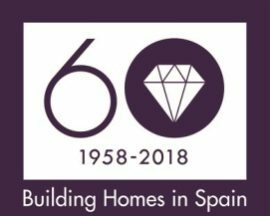 Indeed, many of those drawn to Spain end up wanting more than just a week or two in the sun, which is why leading Spanish home builder Taylor Wimpey España has enjoyed 60 years of success building in areas like the Costa del Sol, Mallorca and the Costa Blanca. The pretty seaside town of Punta Prima is currently home to two Taylor Wimpey España developments. Within around 30 minutes of both Murcia and Alicante airports, Punta Prima is easily accessible from a wide range of locations. Its blue flag beaches are some of the cleanest in the area, while the lovely promenade is the perfect place to wander, relax and dine. Taylor Wimpey España’s Panorama Mar provides seafront apartments on Punta Prima beach, with spectacular sea views. The two and three-bedroom homes feature good-sized terraces for soaking up the sun. Ample landscaped gardens provide a lovely setting for treasured holiday moments, while for those who love the water, the site provides three outdoor swimming pools, including an infinity pool and a hydro-massage pool. Children have their own paddling pool and playground area. Homes at Panorama Mar are available from €319,000 plus VAT. La Recoleta III, meanwhile, offers beautiful apartments with access to the beach and sea just a few meters away. Wide avenues lead down to the sands, in between the Mediterranean-style buildings and immaculate garden areas. Individual apartments are well-designed and feature private terraces, while the penthouses provide spacious solariums and outstanding views. Prices start from €219,000 plus VAT.